On Sunday morning someone in our assembly read from 1 Peter 3. It was one of those great moments where you see God's hand directing open worship. Little did that person know, but another group in the assembly had been looking at the same passage during the week. Specifically we had been looking at the instruction to be always 'prepared to make a defense to anyone who asks you for a reason for the hope that is in you; yet do it with gentleness and respect' (1 Peter 3:15). According to 1 Peter 3:15 we Christians need to be ready to answer people's questions about our faith. We need to be able to explain why we believe what we believe. In other words we need to be prepared for every evangelistic opportunity. In our housegroup in East Leeds we've been endeavouring to do just that. In order to be prepared to share our faith we've spent the last 2 months doing a Two Ways to Live course. 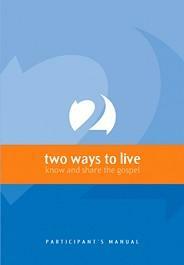 Two Ways to Live is probably best known as a gospel tract (and a very good one at that), but it's actually a simple gospel outline used in a variety of resources such as tracts, CD-Rom multimedia presentations and evangelistic Bible studies (all available in the UK from The Good Book Company). The Two Ways to Live: Know and Share the Gospel course is designed to help Christians to know what exactly it is that they're supposed to be telling non-Christians in evangelism, and to learn how to communicate it effectively. The course uses the Two Ways to Live outline to help Christians present the gospel in an ordered way so as to be understood, as well as to convey the necessary background information that those without any knowledge of Christianity or the Bible will need to make sense of the gospel. In East Leeds we greatly profited from the course. We had quite a mixed age group (from 11 years old up to adults) and all ages seemed to cope quite well with the material. But even more importantly, all ages got a renewed motivation and confidence for evangelism. The course may be over, but we're still praying that it would bear much fruit in the weeks and months (and years) ahead. So if you're looking for some material to help your group prepare to know and tell the gospel, I highly recommend Two Ways to Live: Know and Share the Gospel.